Also keep in mind that special education supports can look different school board to school board. For example, some school boards have self-contained special education classes while others provide a more inclusive model of education. As well, school boards have a range of professionals beyond teaching staff who assist in supporting students with special needs. Your school board may have access to child and youth workers, itinerant teachers of the blind, deaf, gifted, etc., speech-language pathologists, or psychologists, just to name a few. The board’s Special Education Plan is a good source of information about special education services and supports provided by each board and can be found on the board’s website. Parent’s Advocacy in the School offers a comprehensive variety of services relating to educational advocacy for children with exceptionalities. Ed Mahony is a special education resource teacher in Hamilton, Ontario. He has over 20 years of experience teaching educators & parents about ASD, special needs, avoiding crisis behavior & advocacy strategies in colleges & other agencies throughout Ontario. This is an independent organization working to support public education in Ontario schools. This is an online portal to effective strategies and resources for teaching students with special needs in Ontario’s elementary and secondary schools. 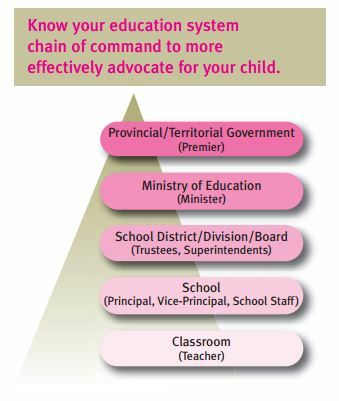 This is from Learning Disabilities of Ontario (LDAO). It goes through advocacy, the IPRC process, and IEPs. This document describes the province-wide standards that school boards must meet when developing, implementing, and monitoring IEPs. This guide provides comprehensive information about legislation, regulations, policies, program planning, and resources pertaining to the education of exceptional pupils in Ontario. This document describes the accommodations and modifications that may be part of a student’s IEP. This resource guide is designed to support educators in Ontario schools in planning and implementing effective educational programs for students with ASD. It contains information, strategies, and practices that can be put to use in the school and the classroom. It also includes a collection of sample materials reflecting current practices in schools, as well as lists of references and resources for further reading. This guide is for staff, parents, and community partners to facilitate successful entry to school for all children, including children with special needs. This guide provides information and directions to assist principals and teachers in making decisions about accommodations for students with special education needs, special provisions for English language learners, deferrals and exemptions. The Safe Schools Action Team was mandated by government to conduct a review of the Safe Schools Act (Part XIII of the Education Act), as well as its regulations, and related policies and administrative practices. The Team heard concerns from parents, educators, support staff, community groups and residents of communities across the province. This report summarizes the results of that review, which was conducted through broad public consultation, with input from more than 700 parents, educators, students, and other community members across Ontario, and written submissions from organizations, school boards and individuals throughout the province. This report is a day-to-day resource for educators, a useful hands-on reference document that will enable every classroom teacher to fully support all the students in his or her classroom. This resource sets out the requirements of the Ministry of Education that govern the policies and programs of all publicly funded elementary and secondary English-language schools in Ontario. Many policy directives to school boards from the ministry have been issued in the form of numbered policy/program memoranda (PPMs). Some of these PPMs concern special education. A transition plan is the school’s written plan to assist the student in making a successful transition from school to work, further education, and community living. This guide outlines the policies, roles, process and strategies involved. This document focuses on transition goals to set in high school so that skills are practiced and developed before starting college or university.